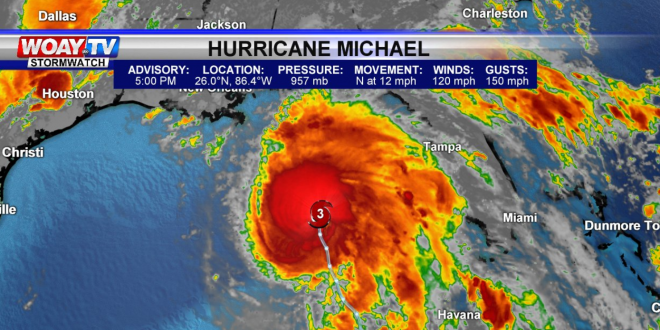 "Monstrous" Hurricane Michael Reaches Category 3 - Joe.My.God. An estimated 120,000 people along the Florida Panhandle were ordered to clear out on Tuesday as Hurricane Michael rapidly picked up steam in the Gulf of Mexico and closed in with winds of 120 mph and a potential storm surge of 12 feet. Beach dwellers rushed to board up their homes and sandbag their properties against the fast-moving hurricane, which was expected to blow ashore around midday Wednesday. The speed of the storm – Michael was moving north 12 mph (19 kph) – gave many people a dwindling number of hours to prepare or flee before being caught up in damaging wind and rain. By 5 p.m., Michael had winds of 120 mph and was getting stronger, drawing energy from Gulf waters in the mid-80s. Florida Gov. Rick Scott warned people across northwest Florida that the “monstrous hurricane” was just hours away, bringing deadly risks from high wind, storm surge and heavy rain. The hurricane was forecast to deliver as much as 1 foot (30 cm) of rain in parts of Florida, Georgia and South Carolina. Western Cuba was also forecast to get torrential rains. The Federal Emergency Management Agency had numerous teams deployed and ready to respond, said FEMA spokesman Jeff Byard. About 2500 National Guard soldiers were assisting and more than 4,000 troops were on standby. Some 13,000 utility restoration workers were also on standby. President Donald Trump told reporters at the White House the country was very well prepared for the hurricane, adding it was much bigger than had been expected.